Microblading is a form of semi-permanent make-up in which the pigment is deposited by the upper layers of skin being penetrated by needles in the form of a blade. The instrument used is a hand-tool. Unlike a tattoo, where a machine and needle is used to penetrate the dermal layer to deposit pigment; microblading is semi-permanent (It will fade and shed out over time) and it only penetrates the top two layers of skin. MicroSHADING is known by many other names: Ombre Brow, 3d or 6d brows, Micropigmentation, dimensional brows, etc. The difference is MicroSHADING is performed with a machine. The machine deposits pigment at a lower level, therefore is more permanent than microblading. The machine’s needles pierce the skin depositing pigment in a soft, stippled effect or even in cleaner lines. The machine is an excellent tool for creating density, dimension, and depth to a brow. The machine technique is highly recommended for oily skin types, and it will last longer than microblading, typically fading out within 3-5 years. MicroSHADING is beautiful when mixed with microblading. The treatment may last anywhere from 6 months to 5 years; depending on your lifestyle, heredity, aftercare, etc. affect the duration of your treatment. Therefore, touch-up appointments scheduled 6 and 12 weeks post initial visit are strongly advised to achieve a uniform outcome. A healing period of 4-6 weeks in between appointments is required prior to a touch-up procedure. 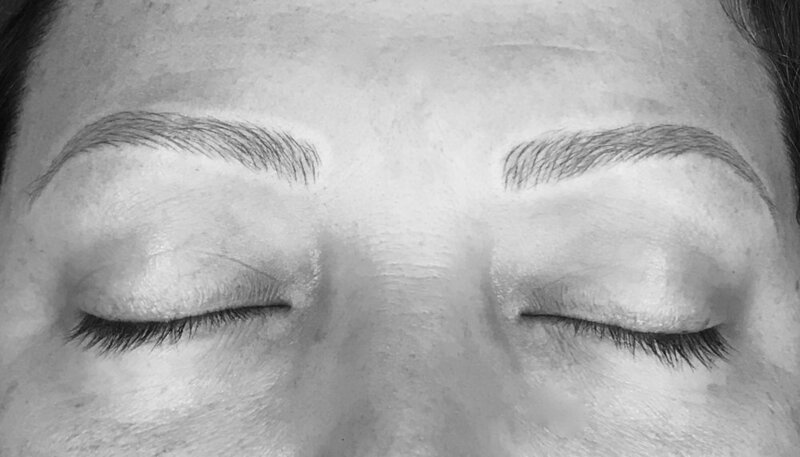 On a rare occasion for microblading, the pigment may migrate to a lower level of the dermis and become permanent; whereas pigment for microshading is deposited into the lower levels and is more permanent lasting 3-5 years. At The Lash Extension, we believe one size does not fit all. We were certified and trained by Lithuanian Permanent Makeup Master, Rita Romo. Both Rita and I have studied Architecture and Design. Why is this important? Because we have an acute understanding of how to lay out your perfect brow based on the Golden Ratio. The way your hair grows naturally is also important. Strokes and hair growth patterns are important in achieving a natural, cohesive brow appearance. Strokes that go against the grain can make you look angry and the hairs can appear unnatural. WE FEEL YOUR PAIN!!! This is why it is imperative you check out your salon, talk to your stylist. Look at their work, drawings, salon, sanitation etc. You get what you pay for; and good brows aren't cheap..and cheap brows aren't good! This is your face...trust someone that knows what they are doing - This is an unregulated procedure in many counties because it is so new. As of July 2016, The Lash Extension was the ONLY salon in Columbia County, GA working with the Health Department as well as Columbia County Licensing and Permits to be compliant. We have completed the Bloodborne Pathogens certification; and are also certified in First Aid and CPR; and we trained under a MASTER ARTIST. We practice our craft daily and we start conservatively - we can add on; but we can't take away. We CARE about doing things the right way, and take extra precautions to make sure we are compliant. We understand the skin too. At this time (September 2016) microblading courses are training anyone...This means anyone not versed in skin - or brows - can be trained. We ask you, would you trust a licensed Esthetician or an inexperienced layperson to give you brows? My money is on someone that really knows the skin; and who is a trained artist. At this time, laser removal is the best option for correcting poor microblading applications. It is also possible to lift some of the pigment at the time of the service if you are not satisfied. However, once the healing process has begun, you will have to wait it out. The pigment will lighten - but the shape will not change. At The Lash Extension, we would much rather start with a clean, fresh slate and give you wonderful brows. Corrective work is not recommended - in fact, most stylists will NOT touch up over someone else's work. The best option is laser. The microblading procedure may be slightly uncomfortable. The procedure involves abrading the skin and depositing pigment in the abrasions. Some folks find it more uncomfortable than others. If you are 5 days before or after your menstrual cycle, the pain may feel more enhanced. There may be swelling and redness following the procedure. You may experience minor bleeding. Initially the pigment will appear very dark. Like Groucho Marks dark. Immediately after the procedure, the pigment can appear 30-50% darker than the desired result. REST ASSURED, THIS WILL FADE! The reason is because your pigment is mixed with blood and has created a scab. This is normal for the healing process. PLEASE BE PATIENT. The pigments WILL fade. Once your skin heals we will touch-up the brows again. Clients with oily skin may not hold pigment as well as those with drier skin types. This is why we recommend 3 visits to ensure you have proper coverage. Pigment loss is common, and all skin is different. Some hold pigment better than others. Some skin types (especially oily skin) have trouble retaining pigments and may need to make additional visits. A negative patch test does not guarantee that you will not develop an allergic reaction after the procedure. Allergic reactions to anesthetic may occur. Infections may occur if aftercare instructions are not followed correctly. ALWAYS WASH YOUR HANDS prior to touching your treatment area. If you have an MRI or CAT scan within 3 months of your Microblading/Microshading procedure; you should notify and discuss with your physician possible side effects. Though it is possible scarring may occur, it is rare. Have you used Retin-A, (or any retinoids) or AHA products within the last 2 weeks? Have you used Accutane or Steroids within the last 6 months? Have you ingested any of the following in the last 2 days: Aspirin, Ibuprofen, or Alcohol? Have you had a reaction to a numbing dental injection? Prior to dental procedures do you receive antibiotic therapy? Have you ever had a reaction to topical creams? Are you currently under the care of a doctor or hospital specialist? Have you received chemotherapy or radiation within the last 12 months? Have you ever had Botox®, Juvederm®, or any other injectables within the last 6 weeks? Have you ever had a sensitivity or reaction to any topical or cosmetic products? Have you had a chemical or laser peel in the last 6 weeks? Do you plan to have it done? Have you received permanent make-up, micropigmentation or a tattoo before? Have you ever had a tattoo removed? Do you have a tendency to rub your eyes or pull on your eyelashes (Trichotillomania)? Do you suffer from eye Infections/styes? Do you receive regular facial treatments? (This will fade your procedure more quickly). Do you have a tendency to develop hypotrophic/raised or keloid scars? Do your scars heal a darker color than the rest of your skin? Do you bleed or bruise easily? Do you have any skin healing issues? Cancer/Cancer treatment - you must be 12 months out from your most recent treatment. As with all cosmetic procedures, individuals should not make their choices lightly. We recommend clients always do their research, understand the procedure, and compare different artist's work and portfolio prior to making their decision. The Lash Extension shall work with clients to create a flattering brow shape. Clients will review and verbally approve the initial placement of the brows. We shall attempt to create an even appearance with the understanding our faces are never perfectly symmetrical. Unevenness and density, even pigment alterations of the microbladed brows shall be modified at each touch-up appointment. Microbladed brows will eventually fade if touch-up appointments are not maintained. Always thoroughly wash hands prior to touching the microblade treated area to avoid infection. Do not ingest Aspirin, Tylenol, Advil, or Alcohol 2 days prior. Many clients take ARNICA (Sublingual tab from GNC or Health foods store) to promote healing. Gently cleanse by washing hands with UNSCENTED ANTI-BACTERIAL SOAP; and rinse with tap water. distilled water. Pat dry, and apply AFTERCARE ointment. Repeat every 2 hours while you are awake. every night during the healing process). Always thoroughly wash hands prior to touching the treated area. Only use AFTERCARE Ointment 1-2 times/day for days 1-10 until scabs start to fall off. ***If a crust appears on the pigmented surface DO NOT FORCE THE REMOVAL BY PICKING, SCRATCHING OR WASHING!!! wet, pat dry very gently with a clean paper towel or tissue. Our procedure/results require careful aftercare maintenance. Please follow the instructions thoroughly outlined. days depending how you care for your application and your individualized healing process. It is recommended you resume normal activities after 14 days following treatment. Be aware at or around weeks 2-3 a ghosting effect may occur. This is due to the skin healing itself. The pigment may appear lighter or non-existent. Please be patient. The healer cells are occulouding your pigment. After the skin has healed, the color should return. This may take 3-6 weeks. If color does not return, schedule your touch up appointment for us to redeposit pigment. Be aware that everyone heals differently and results will vary. Certain areas may not pick up during the first session and will need to be refilled. It is rare, but possible the entire brow may need to be retouched.Pigment, thickness, shape and/or strokes may be added at the touch-up appointments. Individuals with oily skin often require a deeper shade during the touch-up sessions due to the natural oils in their skin which have a tendency to push pigment out and lighten it. Results are not guaranteed. Contact us or set up your appointment online now. Text or call 404-884-4828 or email us at: Info(at)TheLashExtension.com (please replace (at) with @) or you may schedule your appointment online anytime online. Initial Microblading visit: $400.00. A 50% deposit of $200.00 is due at the consultation to book the full service appointment. ($175.00 + $25.00 Consultation fee = $200.00 = 50% deposit). At the time of your full service, the balance of $200.00 is due. 2.5 hours. Touch-up visits $150.00 each. Recommended at 6 and 12 weeks after initial visit and depending on fading. Touch-ups after 6 months may be subject to an increased cost, no more the cost of the initial visit. MicroSHADING uses a machine to achieve a denser, stippled, powdered/ombre effect. The machine adds more natural dimension, and is recommended for oily skin. It is possible to mix both microblading and microshading; however, the cost of services will reflect the higher price of the two services. Please note, there are no refunds issued for this service. Thank you for your interest in our services. We will follow up with you shortly.